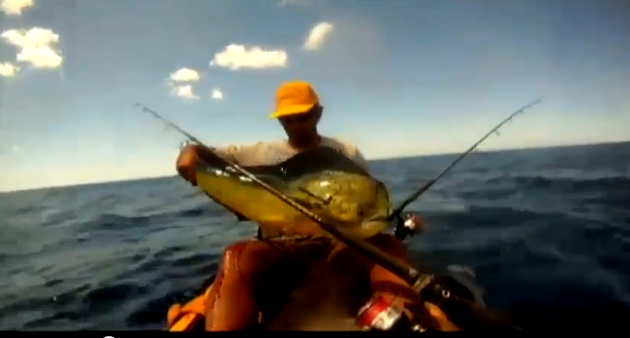 Have you seen the video of the kayak fisherman off Hawaii who loses his catch to a shark? The kayak fisherman, Isaac Brumaghim, was a few miles off the shore of Oahu. He fishes with a Go Pro mounted to the bow of his kayak, so all his fishing action is caught on film. Isaac was reeling in a good-sized Kava Kava Tuna when he noticed something "green and grey" nearby, but was focused on his catch so continued fighting to land the fish. That is, until his fish leaped out of the water and a shark followed the fish, leaping out of the water after the fish. The shark appeared to be either a Galapagos Shark or a Tiger Shark. It missed the tuna on the first jump and continued to fight for the tuna, but so did Isaac. You can see Isaac reaching to pull his line and the tuna into the kayak when the shark bumps Isaac's kayak and grabs the tuna off his line. You can see on the video the size of the shark - plenty big - as it jumps at the fish. Isaac continued to fish after the shark encounter and reeled in a few more fish!